can you chair actually today? I am happy to scribe. < hhalpin > PROPOSED: to meet again Wed. March 10th: Social APIs and Mobile Widgets: Thomas Roessler on DAP, Scott Wilson on OpenSocial Shindig, and Robin Berjon and Marcos Carecas on W3C Widgets. Harry: Next week - interesting week - there's been a lot of talk of OpenSocial and its connection to w3c widgets. < hhalpin > Not 4:00UTC? Harry: the issue is - because of everyone's schedule, they won't be able to come online until 5:00 pm UTC, not 4:00 UTC. Harry: are people familiar with w3c widgets and open social. Dan: maybe we should just do it at 5:00 instead next week. < hhalpin > Assuming 5:00 next is fine. Harry: That should be a one-off-move. I am very much looking forward to this call. < AnitaD > wasn't it the deadline we agreed? Dan: I will work on this. Harry: I put the WBS questionnaire on there - about the importance of various social web standards - would appreciate answers. Dan: "architecture of social web based on linked data" was the headline proposal from Tim at Santa Clara f2f. Dan: and there was a diagram (posted by Fabien above). Fabien: rely on linked open data infrastructure. Transparent API for any rich client of app to access the profile of the user independently of how and where they are stored. < hhalpin > since there is nothing written down, we're happy to write it up for you! ... There are APIs but they are tweet-specific. Tim: APIs are poor because APIs hide the nature of the underlying data. This isn't scalable to new things. The Linked Data Way is to represent it as data. Tim: In a sane, clean design, the data is linked data and the access control list is linked data. < hhalpin > as in how access control can *be* linked data, rather than a policy language operating over access control. < bblfish > what's the URL? Tim: So keep that architecture diagram in one window and follow along. Tim: So the design of this - going on to [slide 6]. Tim: I would like to build on the cool things the community has developed. 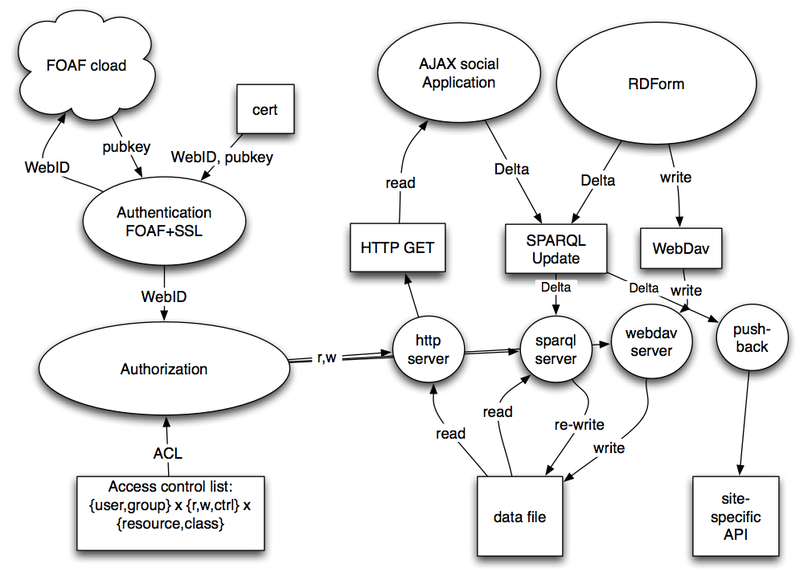 WebID- FOAF+SSL, RDF, WebDAV, SPARQL Update, Widget libraries, Application Builders. < hhalpin > can we get links to those apache modules? Tim: implementation has been written in an apache module[ of this kind of access control on top of] WebDAV. Tim: There is a header that MS has used to tell their applications not to use front-page extensions. Tim: Idea is to use the HTTP link header to point to the access control list. ... Someone can read it and write it and tweak it using SPARQL updates. Tim: Web Groups - how do they work? - URIs - if I look up a group name, I get back a document which has the URIs of the people in the group. ... There's a question of how much RDF processing do you want the system to do? Tim: You log on with a WebID - WebID tells you who user is pretending to be but can't be trusted. ... You can imagine doing very complicated rule-based systems, but there is tremendous advantage on being really simple. ... This will be an application-independent architecture. ... So imagine you're designing Twitter. The first thing you need to create is a public list of tweets. We need conventions of generating URLs that won't clash with other applications. ... you need to have an "incoming drop box" so when someone tweets about you, you can [be alerted]. ... in a centralized application all links are automatically both ways. When I follow you on Twitter you know that because it's the same application. ... in a distributed way, you need to duplicate this with messages. ... cross-application is valuable. [Allowing other applications to access all this data]... creates an app market for this data. ... they should be portable but should not have to each make their own data space. This architecture allows them to work in a context where they are using data which is being produced and managed by other applications. < hhalpin > increasing innovation in apps over open space is a good business case. Tim: When we have this open system and open linked data architecture, we will see a [jump] in innovation in these apps. Danbri: WebID - I have a mixed sense of what a WebID is. Is it a euphemism for a URI? Or is it a specific technology? Tim: A WebID is specifically a FOAF+SSL ID. It's an alternative to an openID. Tim: I can imagine there will be WebID you get because you visit a web site and you have control over it and you will have WebIDs for specific reasons - e.g. a WebID for W3C or for your business. Danbri: If I copy your FOAF file and put it on my website. It still says true things about you - is it a webid? Tim: No - when you look up a WebID it gives you a public key. And when you look up that [FOAF] file it will give you the wrong public key. Danbri: Second question - one of your slides you talk about groups. In FOAF we have [a mechanism] for this. Tim: Is a group a class? Tim: That's a design issue. < danbri > apache code url? < melvster > did you want the apache_mod URIs? < timbl > <#ThisGroup> is rdf:type of Joe, Fred, Albert. Harry: 2 quick questions. I think the concept is good and I want to make it part of the final report. But 2 critiques from some working on the open stack. < pchampin > yes, but how do you conveniently create one when you need it? Harry: first problem with certificates - they vary between machines, different devices, if I go to an Internet cafe how can I use my certificate... So this is in support of the username/password. < hhalpin > so a one-time password would be the way to go here? < hhalpin > so a one-time OpenID-style login would create the certificate...could we just have the certificate then automatically put through to other apps with minimal user-intervention? BBlfish: so if you're in an Internet cafe you can set up a new certificate for only an hour... You can have as many certs as you want and you can disable certs just by removing the public key from your profile. Tim: If the thing is set up to use public-key cryptography then it's easier to down-grade it to openID like systems and you can cross-link OpenID and WebIDs. ... of course going into an Internet cafe and logging into your common provider is [low security]. Tim: SSO means you can do a lot of damage with just one login. ... When you're at the bank, typlically you can look at your statement but then [an extra level of security is requried] when you want to make a payement. ... "These are two versions of Harry - the strong and the weak one." ... we need to have a good answer. ... and "you're forcing me to do all this work." Tim: there is a cloud - web services - that people are using - but it doesn't devalue the linked data cloud. < hhalpin > any more questions? But this is too big a quetion for today. < cperey > bye for now! < hhalpin > oh, good point! < yoshiaki > TimBL: W3C is engaging community in general. < yoshiaki > ... and invite them to TPAC. < danbri > http://www.w3.org/News/2009#entry-8674 fits in? < hhalpin > take care timbl! < trackbot > Created ACTION-132 - Send Team a simple e-mail overview for Social Web XG [on Harry Halpin - due 2010-03-10]. < hhalpin > bye all!